If absent or coming late, please state the student name, teacher and reason for being absent or tardy. If coming late and needing a hot lunch, you must call in before 9:15 to request a hot lunch. Students arriving late without placing an advance order will need to bring a cold lunch or will be given a cold sandwich and milk. Central Valley School District #356 has adopted policies concerning “Student Responsibilities and Rights” Policy #3220. Parents and students at Adams Elementary and throughout the Central Valley School District are informed of these policies. Students are expected to abide by the expectations established to provide a positive learning environment. When violations of these expectations occur, the school is authorized to take appropriate action designed to insure more responsible behavior on the part of the student. When violations of the laws of the United States, the State of Washington, and/or its subdivisions are also involved, the school may refer such matters to parents, legal guardians or appropriate authorities. These pages aim to detail and highlight specific responsibilities and rights included within the districts’ adopted policy. Its purpose is to communicate Adams’ mission, goals, philosophy, expectations and program opportunities. 8:55–3:15 PM Mon., Tues., Wed., & Fri.
School is dismissed at 3:15 PM. Students need to be picked up at that time. Those students who ride the bus are expected to go directly to the bus waiting area upon dismissal from the classroom. Students who walk or ride their bicycles should leave immediately for their home. There is adult supervision at the cross walks after school and no supervision on the playground or field. This is a safety concern for your student/s. Students who are picked up out front after school should proceed immediately to the front of the building and wait in their grade level line for their ride. Adams car valet supervisors will be on duty until 3:25. After that time, students will need to be picked up in the Adams office and signed out. For student safety reasons, we encourage all student pick-ups in the drive-through lanes at the front of the building where there is adult supervision and traffic control. The breakfast and hot lunch program will continue at Adams Elementary School during the coming year. Breakfast will include milk, cereal, and juice and is served from 8:30 to 8:55 AM. The National School Lunch Program includes an entrée, vegetable, fruit, dessert and milk or juice. Hot lunch and milk counts are ordered for each day by 9:15 AM. Call the school office (558-4001) by 9:15 to notify if your student is arriving late and will need a hot lunch ordered. If your student has milk allergies, a doctors’ note will allow for an exchange of juice for milk. To prepay for breakfast and lunches you may send checks or online payments are available with a credit or debit card. Please allow 3 days to process the credit or debit card payment. If your family qualifies for the “free” or “reduced” lunch prices through the National School Lunch Program, you MUST complete a new application every school year for review and approval by the CVSD Food Services staff. List each member of the household on the application. An extra table is offered and available to any student who may need more time to finish eating their lunch before they head outside for recess. The importance of regular on-time attendance in school cannot be overemphasized. It is directly related to student success. All students should be in school every day they are physically able. Irregular attendance makes it extremely difficult for students to keep up with their class work. Repeated absences without proper cause may generate reporting to Spokane County Child Protective Service or referral to the BECCA Attendance law process. If a student will be absent or late, parents or guardians are expected to notify the school (558-4010). When students are not at school, it is a protective issue for the school to be aware they are safe with an adult. Parents may ask a teacher for school work for students who will be away from school for a length of time. At least one week advance notice is preferred. Without this consideration, make-up homework and grades cannot be guaranteed. When the student returns to school the state requires that you send a note explaining the absence. Students arriving at school after the tardy bell at 9:10 must report directly to the office. Please notify the office (558-4001) before 9:15 if the student will be late and in need of a hot lunch. Lunches are ordered based on the class counts provided with attendance. A student arriving late, without prior notice to the office, will be expected to bring a sack lunch or receive a cold sandwich and milk in lieu of a pre-ordered hot lunch. The school and classroom phones are for business purposes. Students with valid reasons will be allowed to use the phone. They will not be allowed to call for rides or make alternate after-school arrangements. Each student receives our SOAR Handbook the first day of school. The expectations is that families review the SOAR expectations and sign the last page and return that page to their teacher. Keep the handbook as a reference for your family. We want our learning environment to be the very best and these expectations will support just that. Home and school need to cooperate in the matter of appropriate dress for school. This is your students’ place of business and they should arrive dressed and prepared to successfully complete their “job”. The office must be able to contact a parent through a local telephone number in the event of an emergency. Moving outside the Adams’ attendance boundary may require specific steps for “choicing” to allow the student to remain through the school year or transfer to the new school. “Choice” options may be closed due to overcrowded schools and students in CV being displaced and overflowed from their home schools to Adams. It is important that the office has access to current & correct LOCAL emergency telephone numbers. All visitors to Central Valley School buildings are REQUIRED to report to the office on arrival, sign in and put on a visitors badge if you want to enter the building. Class is generally in session and teachers are involved in teaching. Interruptions should be kept to a minimum allowing all students the opportunity to learn. Adams students are not allowed to host visiting friends or relatives during the school day. Parents, visitors, student interns, etc. must sign-in at the office and wear identification tags provided by the office. Students who ride the school bus are subject to expectations set by the CVSD Transportation Department. Riding the bus is a privilege. Improper conduct on the bus will result in this privilege being denied. Bus students are to depart the building immediately to wait for their bus at the time of dismissal from class. During the school year, many requests are made for students to exit the school bus at stops other than their own. To insure that both families are aware of differing arrangements, all students will be required to present a written note from home with permission and explaining the change. The school and bus driver will NOT allow changes to be made without prior written approval from home. If your student will be walking to a destination other than their home, a note must be provided to the teacher and office explaining the change. Verbal messages often can be misinterpreted and result in unnecessary concern for everyone. Your student/s should be emphatically expected to maintain a normal before and after school schedule. First and foremost, all personal items should be left at home unless it is a prearranged “sharing” or “show & tell” day. Articles found in and around the school should be turned in to the office. It is important that clothing, books, backpacks, etc. contain the students’ name. This assists in returning items as soon as possible. Personal items & valuables should NOT be brought to school. During conference week, families are encouraged to look through the Lost and Found to retrieve articles. All unclaimed lost and found items are donated to charity at the end of conference week and at the end of the school year. Students are required to wear appropriate clothing for weather conditions while on the playground and should arrive at school dressed to be outside. Indoor recess is called depending on weather conditions immediately prior to recess. CVSD will notify all major media (radio/television) by 6:00 AM of school closures due to weather or emergency events. 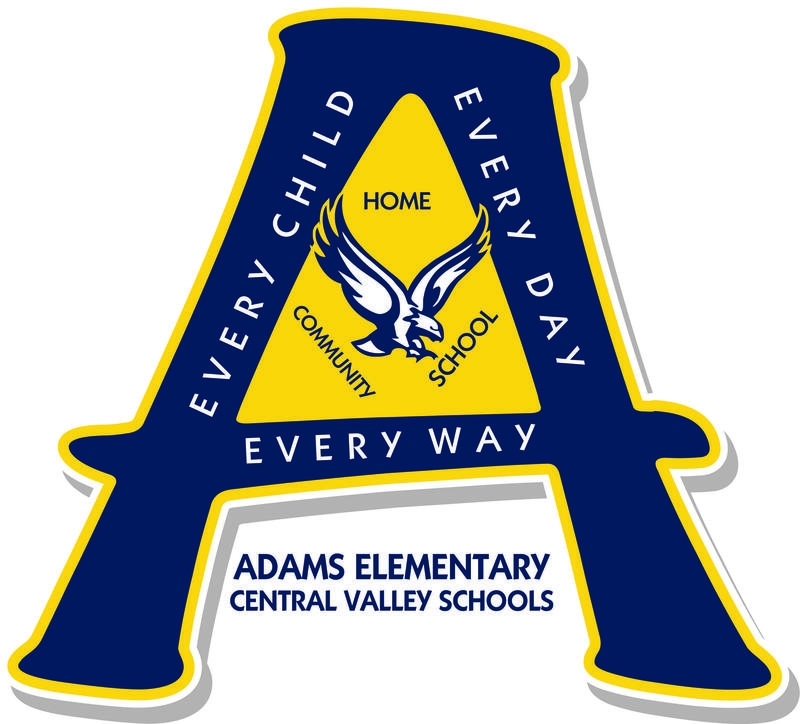 Adams Elementary is a part of Central Valley School District and NOT “Spokane Public Schools” (which is Spokane School District #81). Also after 6:00 AM, the CVSD Transportation Hot Line phone (558-5572) will have a recorded message indicating school closure information and/or bus route changes due to weather. Student safety is important to everyone. Expectations and precautions are in place to prevent mishaps causing injury. Students are expected to report to teachers/adult supervisors any event causing injury. When medical attention is needed, the student will be escorted or sent to the health room in the school office. Parents will be contacted as needed unless the injury is minor. Only an absolute emergency authorizes Adams staff to transport a student for medical treatment. Nurses are not available in the building on a full-time basis and the staff is qualified to provide minimum first-aid intervention and no diagnostic opinions. Students required to receive medication (prescription or non-prescription “over-the-counter” medications) during school hours must have on file in the school office an “Authorization for Administration of Oral Medication at School” form signed by a physician and parent. Such medication will be locked in a secure cabinet and administered according to the physician instructions. Medications must be provided by the parent in the original container with the student’s name and instructions printed clearly. Thank you for taking the time to read these expectations and for helping all of our students understand them. This will help ensure that our learning environment will be safe and strong for all of our Adams Eagles!